Church services are held every morning at 11 am. For special exceptions, see Events Page. The choir at Roseneath United Church, under the direction of organist Steven Baric, is a dedicated group of ten to twelve leaders who come together to lead worship through music. They rehearse every Sunday morning before service, and sing anthems of praise every week from September through June, as well as for special services and memorials. They also contribute their musical talents to events in the community, and join forces with other area choirs for special concerts. Twice a year, Roseneath United Church provides pork and beef suppers at the Alnwick Haldimand Civic Centre. See Events Page for details (Feb & Oct/Nov). To act at all times in the best interest of the Congregation and staff; to demonstrate Christian leadership within the community and ensure that the Church Council maintains it’s integrity in providing Christian values to the Glory of God in Jesus Christ for the growth of the Church. We are not alone. We live in God’s world. We believe in God, who has created and is creating, who has come in Jesus, the Word made flesh, to reconcile and make new, who works in us and others by Spirit. We trust in God. We are called to be the church, to celebrate God’s presence, to live with respect in Creation, to love and serve others, to seek justice and resist evil, to proclaim Jesus, crucified and risen, our judge and our hope. In life, in death, in life beyond death. God is with us. We are not alone. 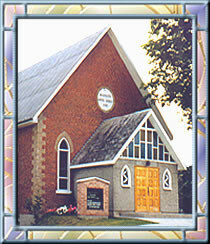 Roseneath United Church began as a Methodist congregation in 1855. But as a result of a division within the Methodist hierarchy, the Wesleyans and the Methodist Episcopals united in 1884 and the Church became part of the Alnwick Methodist Circuit. Church services and quarterly board meetings were originally held in local school buildings. In 1881 the deed for the present day site was purchased from G. Liscum. The building committee was comprised of Dr. Noden, Lewis Liscum and John Thackeray. James and Colin Steele were tendered to erect the Church for the sum of nine hundred and thirty dollars. Rev. William Buchanan was appointed to the newly formed Alnwick Circuit. The original building didn’t have the accoutrements of modern day living. In 1908 an alcove was built at the south end of the Church, a furnace was installed and a new shed was erected. The Church was united with the Presbyterian congregation in 1925 and continued to worship in the Methodist building as part of the newly formed United Church of Canada. Major renovations were undertaken in 1958: the basement was remodelled, the sanctuary was decorated, a new organ was installed and a vestibule was built at the front entrance. Other updates to the Church were carried out in 1966 that included a water well, washrooms, carpeting, ceiling fans, pew cushions and panelling. In 1977 a new organ was installed and the old furnace was replaced. Since then various improvements and additions throughout the years have blessed us with a small but lovely sanctuary. History of the Roseneath U.C.W. The year 1962 marked a new beginning in women’s work in the United Church of Canada when two of our preceding organizations disbanded, W.M.S. and W.A., and a new one called “United Church Women” was formed. The first regular meeting of Roseneath U.C.W. was held on January 31, 1962. For several years the U.C.W. had three branches within this charge: Roseneath, Fenella, Centenary. For the two years 1969-70 Roseneath itself had two units. In 1971 the two units in Roseneath were combined and in 1976 the ladies of Centenary also joined with the Roseneath branch. Our first study book prepared for use in the U.C.W. was called Signals for the Sixties. Copyright © 2015-2019 Hastings Roseneath Pastoral Charge. All Rights Reserved.